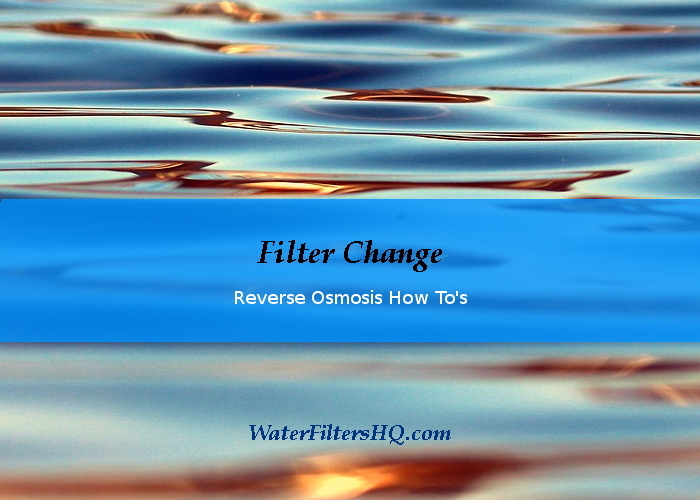 If this is the first time you change the filters of your reverse osmosis system, the whole process might look a bit complicated to you. Let me assure you, it is not. All you need is the new filter, a bucket, and about 20 minutes of your time. If your system came with a housing wrench, you would need that one too. If you have an ice maker connected to your reverse osmosis system, turn it off first. Then turn off the water to your RO system. In a next step, you need to empty the whole system by opening the ro faucet and wait until the tank is empty. Now you can unscrew the filter canisters by turning them to the left. Some filter systems like the iSpring come with a housing wrench. Does this sound too complicated? If your reverse osmosis water filter system has filters that are inside a reusable housing, this might be a good time to clean the housing before you put in the new filters. Caution: Some filters only work when used in a certain direction. To put the new filters in, you just go through these steps backwards. For all of you who prefer visuals to written instruction, watch this. Michael Borders made a pretty good video about the filter change procedure. We reviewed the best reverse osmosis water filter systems here and added a buyer's guide as well for you.